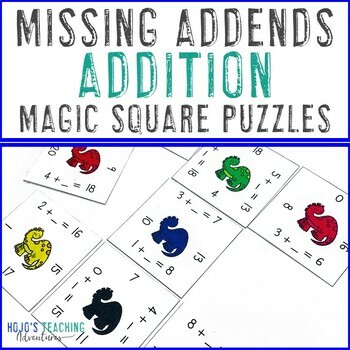 These Addition Unknown Numbers in Equations (Missing Addends) Magic Square Puzzles Math Center Games make it quick and easy for teachers to provide hands on activities that meet the needs of all students! 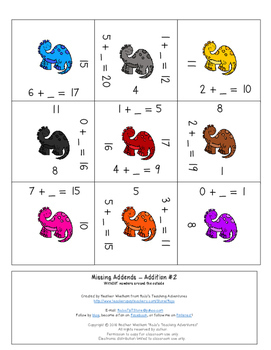 Let your students practice their unknown addend addition facts 0-20 with these addicting puzzles! (Also called unknown numbers in equations) Each puzzle asks students to match 12 different equations within 20. The equations are written in this format: 10 + _ = 18, so the students will match that to the answer of 8. Are you looking for a more challenging Unknown Numbers in Equations products? You can find find one here! There are nine different puzzles in this product. However, there are two of each puzzle – one with numbers around the outside and one without numbers around the outside (for students who need an easier game). This allows you to differentiate to best fit the needs of your classroom! Preparation and Storage: You will need to print off the number of copies you need. (I recommend printing them on cardstock and laminating them.) I have used these as individual work, partner work, and small group work. They also work well for students who finish early or for use during center time. Cut the magic squares out and put them into plastic baggies for students’ use. I put each set in its own plastic baggie. Then I put all of these baggies and one original sheet in a manila envelope with the name of the activity on the front. This way I have the answer key and all materials readily available. Directions to Play: Give students the cut-up magic square sheet. Tell them they need to put the square back together. The first time you have the students complete one of these, I suggest drawing out a 3x3 square on the board so they understand what it should look like. You can also give them the hint (because I have found some do not figure this out!) that the pictures will all be facing the correct direction. Correcting Student Work: To easily check a student’s completed work, keep an original copy of the magic square sheet they are working on. This way you can immediately check to see if the pictures or numbers are in the correct order or not. Love Magic Square Puzzles? You can find even more in my store! 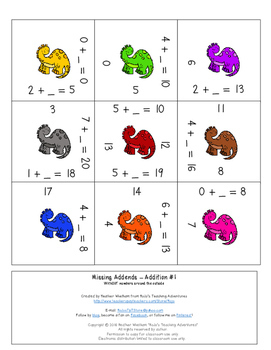 Magic Square Puzzles are great for centers, review, early and fast finishers, enrichment, GATE (gifted and talented education), test prep, and critical thinking skills. Students with special needs also do well with these once they understand the concept. Any student that needs a lesson in perseverance will benefit from Magic Square Puzzles. With this fun game format your students will stay engaged while practicing necessary skills! Just print and quickly cut on the lines and you have instant learning centers that make skill practice fun and engaging.